These finds (1) consist of a violin bridge, two bows (one broken at various points) (2), a box of rosin made by Vuillaume (3), and a roll of gut strings in a reasonable state of preservation (4). It on this last item that our attention is focused. For it is one of the rare instance of gut string samples that can be dated with some certainty: in this case to the early decades of the 19th century. The material I inspected is preserved in an envelope that had already been opened by its discoverers. It bears the stationer’s stamp of the “Cartoleria Rubartelli Genova”, has a seal of red sealing wax showing the symbol of the City of Genoa and a manuscript inscription in black ink: “Antiche corde del Violino di Nicolò Paganini”. As Edward Neill has pointed out (5), in some of his letters Paganini already provided interesting information about the strings he used: “Ho bisogno di un favore: ponetevi tutta la cura, e la diligenza. Mi mancano i cantini. Io li desidero sottilissimi […] . Quantunque tanto sottili devono essere di 4 fila per resistere. Badate che la corda sia liscia, uguale, e ben tirata […] . Vi supplico di sorvegliare i fabbricanti e di far presto e bene.” (I need a favour: to be done with care and solicitude. I am without chanterelles […]. Even if they are very thin they must be made of four strands to endure. Make sure the string is smooth, even and well stretched […] . I beg you to keep an eye on the makers and do this soon and well). And in a letter written from Naples to his friend and confidant Germi, shortly before, on 29 May 1829, we read: “Il tuo Paganini desidera sapere […] quanti mazzi di cantini e quanto di seconde, e a quante fila si desiderano da Napoli, perché ora si avvicina il mese di Agosto, epoca giusta per fabbricar le corde” (Your friend Paganini wants to know […] how many bundles of chanterelles and how many of second strings, and with how many strands, are wanted from Naples, because the month of August is approaching: the right time for making strings) (6). Further information is provided by Carl Flesch (7): “Some thirty years ago the owner of the Schott firm showed the celebrated violinist Hugo Hermann one of Paganini’s letters, wherein the latter begged the head of the firm at the time to procure strings for him like the samples enclosed. Hermann obtained the loan of these strings. After measuring them on a string-gauge, he found to his astonishment that the D-string had the strength of the A-string used today and the A-string the thickness of our E-string, and that the latter was not unlike a strong thread”. In an earlier paper (8) I suggested that these strings were in actual fact guitar strings, given that Paganini was also a brilliant guitarist. But this conjecture needs revising in the light of recent research I have done on the contemporary guitar. In brief, the study shows that the guitar made use of violin strings for the first three strings: in other words, it didn’t use thin gauges at all, as is commonly believed today. Flesch’s information is in any case insufficient to offer any certainty on the matter. First, it is not clear whether the notes (D, A, etc.) associated with each sample were actually named by Paganini himself, or whether that was what Hermann imagined (in which case Paganini might have merely enclosed the string samples without specifying either their notes or the instrument they were needed for). Second, we must remember that Paganini also played the mandolin (9), so it is quite possible that the strings ordered were for this instrument. And finally, we cannot exclude the possibility that his request was merely a favour on behalf of some musical acquaintance. In any case, if we disregard the thinnest string (for which we have no term of comparison) and compare Hermann’s specifications with the table of tensions given by Gorge Hart towards the end of the 19th century (10), we may estimate the presumed “D” as circa 0.84¸0.90 mm and the presumed “A” as 0.65¸0.73 mm: diameters that are decidedly thin for any violin of the time. About the presumed “E”, we frankly cannot say, since Hermann merely tells us that it “was not unlike a strong thread”. Was it perhaps a chanterelle for the mandolin? There is no way of telling. The strings recently found can be assumed to be two “Ds”, three “As” and two “Es”: it would seem likely that they are segments taken from longer lengths and cut to size for the violin. They are straw-yellow in colour, fragile, slightly wrinkly and intact (i.e. never used). The “E” strings have a medium twist (ca. 45° angle), while the “A” and “D” strings have a decidedly high twist (close to 80°). We can well imagine, therefore, this guaranteed excellent acoustic results, in certain respects different from that of strings today, which are often much less twisted and hence stiffer. As we notice, there is no fourth string. This, however, is hardly surprising, because it was customary at the time for the fourth string to be made not by string makers but by instrument makers (if not by the musicians themselves), using a fairly thin second string (11) (12) (13). However, this shouldn’t come as a surprise if we remember that in Italy – from the 17th century, or even earlier (16) – the string were produced preferably from whole guts of lamb (and not ram, which is the male of sheep and) – which in Italy seems not to have been as “popular” as it was in France) of 8¸9 months of age, according to a practice that was strictly standardised and handed down from father to son. As reported in both Italian and other sources (17), the making of a violin chanterelle generally required three “strands” (i.e. guts), but sometimes even four. We find this both in the 18th and late 19th centuries (18). The fact of using four strands doesn’t necessarily imply that the chanterelles were particularly thick (if with three guts the diameter is ca. 0.70 mm, with four it would be ca. 0.82 mm -), but merely that there were times when the gut available to the string maker was a little thinner than usual. This is also confirmed by a passage from one of Paganini’s letters (19). And as a string-maker myself, I can affirm that, final diameters being equal, a string made of four thin guts is much more regular and durable and also truer than one made of three “standard” guts. Paganini evidently knew what he was doing when he ordered the strings: he specially asked for canterelles of four strands (which would enhance the durability and limit the number of false strings) and he even went to the length of asking a trusted person to keep an eye on the Neapolitan string makers. If we consider that the diameters measured agree almost entirely with those of numerous other contemporary sources, and if we also remember that manufacturing was considerably standardised, I think we can rule out the possibility that the individual items shrank as a consequence of further drying. Besides, a finished gut string is already in itself what one might call a “mummified” material. One observes that the working tensions of the string samples present an almost perfectly progressive profile, exactly as one would expect and as is consistent with the surviving historical information. only at a fraction of their breaking load and needed as much elasticity as possible to yield the best acoustic results. These finds seem to document that Paganini also used strings with diameters customary for his day. Though we do not know for certain that they were made in Naples, they were undoubtedly made skilfully. There is some doubt, however, about the meaning of the request in his letter (“I want them to be very thin”), which seems to contradict the other statement that he wants the strings to be “of four strands to endure”. Finally, we cannot exclude the possibility that, in the course of his career, even Paganini (like any other musician today, for that matter) indulged in a little experimentation with different calibres on the only material available, which he also considered as the best: Neapolitan gut. (1) The material was found and is still preserved at the Archivio di “Palazzo Rosso” in Genoa. (2) Attached to the bow in question is a sheet of paper bearing the following note: “Arco di Nicolò Paganini, che adoperò durante tutta la sua carriera artistica. Rottosi l’arco a Newcastel [sic] (Inghilterra) in otto frantumi. Lo fece rimettere insieme dal celebre liutista [sic] Vuillaume di Parigi, ne cercò di valersi di quest arco esclusivamente. 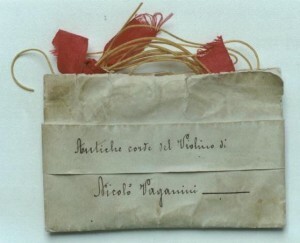 In attestato di verità Achille Paganini figlio di Nicolò” (Bow of Nicolò Paganini, which he used throughout his artistic career. The bow broke into eight bits in Newcastle (England). He had it put together by the famous lutenist [sic] Vuillaume of Paris, and tried to make exclusive use of this bow. In attestation of the truth, Achille Paganini, Nicolò’s son). (4) The strings are all rolled up and bound tightly together by three small ribbons of red silk. (5) Edward Neill: Nicolo’ Paganini: Registro di lettere, 1829, Graphos, Genova 1991, p.80. Letter from Breslau, 31 July 1829, addressed to “Signre Profre Onorio de Vito, Napoli”. (6) Edward Neill: Paganini: epistolario, Comune di Genova, Genova 1982, p. 49. (7) Carl Flesh: The art of violin playing, 2 vols., Fischer, New York 1924-30 (original edition, Die Kunst des Violinspiels, 2 vols., Ries, Berlin 1924-8). 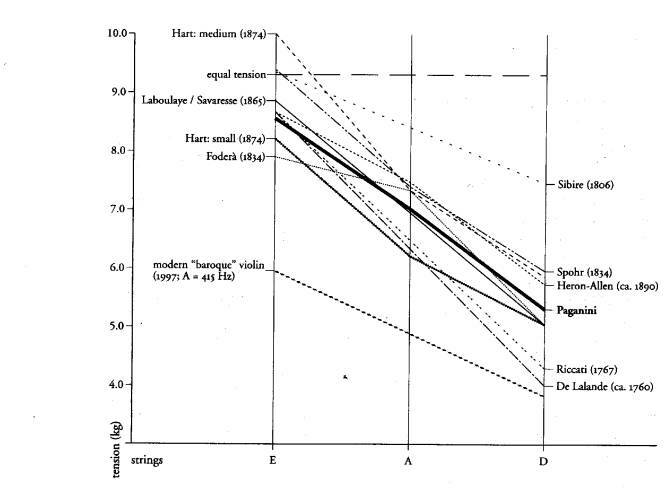 (8) Mimmo Peruffo: “Italian violin strings in the eighteenth and nineteenth centuries: typologies, manufacturing techniques and principles of stringing”, Recercare IX 1997, p. 176. (9) Edward Neill: Nicolo’ Paganini il cavaliere filarmonico, De Ferrari Editore, 1990 Genova, p.27. (11) Edward Neill: , p. 67: Milano 28 Giugno 1823 “…colà mi restituirò a Milano per li tuoi violini, e ti farò fasciare delle quarte di filo d’argento.” (…I will go back to Milan for your violins, and I will have some fourth strings wound with silver wire). (13) Francesco Galeazzi: Elementi teorico-pratici di musica con un saggio sopra l’arte di suonare il violino […], Pilucchi Cracas, Roma 1791, p. 74: “Non sarà, cred’io, discaro al mio lettore, che io qui gli descriva una picciola semplicissima macchinetta, e l’uso glie ne additi per filarsi, e ricoprirsi d’argento da sé i cordoni” (It will not, I believe, be unwelcome to my reader if I describe, and explain the use of, a small and very simple machine for threading and covering the fourth string with silver wire). (14) William Huggins: “On the function of the sound-post and the proportional thickness of the strings on the violin”, Royal Society proceedings, XXXV 1883, pp. 241-8: 247. (15) See Patrizio Barbieri: “Giordano Riccati on the diameters of strings and pipes”, The Galpin Society journal, XXXVIII 1985, pp. 20-34. (16) Statute of the Roman string makers’ guild. Roma, Biblioteca Angelica, Camerale II, Arti e Mestieri, Statuti, coll. 312, busta 12, anno 1642. (17) Francois De Lalande: Voyage en Italie […] fait dans les annèes 1765-1766, 2nd edition, vol. IX, Desaint, Paris 1786, pp.514-9. (18) Edward Heron- Allen: Violin-making as it was and is […], Ward, Lock & Co. London 1884, chapter XII, “The strings”, p. 212: “for the first, or E string, 3-4 fine threads…”. (19) (see note 8) Edward Neill: Nicolo’ Paganini: Registro di lettere, 1829, Graphos, Genova 1991, p.80. Letter from Breslau, 31 July 1829, addressed to ” Signre Profre Onorio de Vito, Napoli”: “Quantunque tanto sottili [i cantini] devono essere di 4 fila per resistere” (No matter how thin, they [the chanterelles] must be of 4 strands to endure).